Gyokuro tea leaves are cultivated under shade. When new leaves begin to bud, the whole field is covered with a woven reed screen, and then that screen is completely covered with straw. (These days a cover made of synthetic materials sometimes takes the place of the natural straw.) This process allows careful control of the photosynthetic activities in the tea leaves, yielding a maximum level of vitamins absorbed from the roots into the leaves. Fifteen days after the field is covered, tea leaves are picked and processed in the same manner as Sencha. Because it contains a higher percentage of amino acid, Gyokuro is richer in taste, and with less Tannin, Gyokuro has a mild, refined flavor. To fully enjoy the subtleties of this sophisticated tea, drink it in small sips and let it linger on your tongue to allow its rich aroma and sweet flavor to fill your palate. 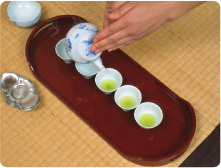 Smaller tea pots and cups made exclusively for preparing Gyokuro are ideal for maximizing the Gyokuro experience. 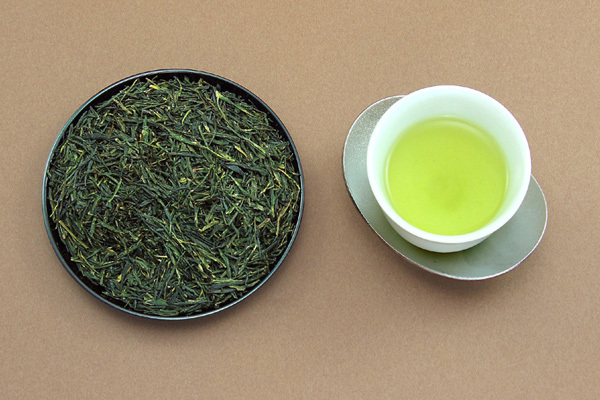 High quality Gyokuro leaves are shaped like thin, straight needles and have a vivid green color. Smaller teapots and cups are used in the preparation of Gyokuro.